Ok, you aren’t literally being watched in the traditional sense, but you are absolutely being tracked every time you are online! Every web page you visit records and stores text data in your computer called cookies. Cookies are often used to track patterns in your internet surfing for the purposes of user-specific advertising, and while most are harmless enough, some malicious parties can use them to make your computer more susceptible to hacks, scams, viruses, and malware. All browsers give users the option to delete their browsing history, generally under the “Tools” tab of their menu options. Surprisingly, however, very few internet surfers take advantage of the function. As a result cookies and tracking information build up in computers over time, not only making them vulnerable to attacks, but also taking up disk space and slowing down functionality. 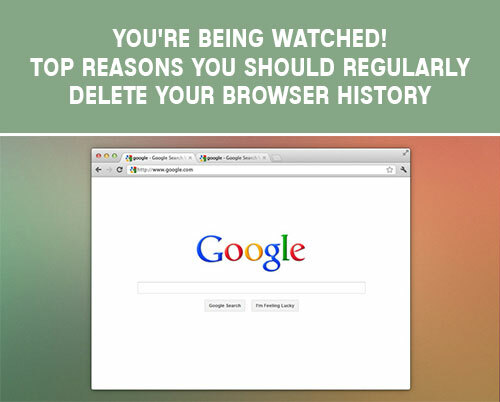 Following are the top reasons to regularly clear your browsing history, cookies, and caches. I don’t know about you, but I don’t like the idea that advertisers or anyone else has any right to know what web pages I visit. But the information is collected… From every web page, every time you visit. Cookies are small text files that are sent to your web browser whenever you’re on a page. Your browser stores that information and reuses it if you visit that page again. While in theory this form of tracking is designed and explained as a way to recall your preferences and enhance your browsing experience, in reality, these data files are little more than a way for people to know what you’re up to and find a way to sell you something. To keep from being attacked through annoying pop-ups and online ads, simply delete your history and stored cookies regularly. Deleting your browser history is a simple way to not only maintain your online privacy, but also make you less vulnerable to hackers. While a few cookies in your computer aren’t likely to cause you any problems, leaving a long history sitting online can make you an easy target to those who wish you harm. Viruses, malware, spyware, all these things can be more easily snuck in to your computer if you don’t regularly clear your history and cookies. In addition to cookies, your web browser also collects data files called caches while you surf. Caches are essentially saved versions of how web pages that you visit look and function. So basically, if you haven’t cleared your caches in some time, you may actually be viewing an outdated version of the web page you are trying to visit. Deleting your browsing history, cookies, and caches, is a simple way to ensure that the sites you’re visiting are the most up-to-date versions available. Ultimately, cookies and caches are not needed. While the files are quite small, they can still build up and bog down your system performance. If web pages are taking longer to load then usual or you are encountering a lot of network timeouts our crashes, you can boost performance by clearing your browsing history, cookies, and caches. Doing this once a week or at least every other week will keep your browser operating at optimum speed and performance. By simply deleting your history, caches, and cookies, you can free up considerable memory and hard disk space. The information collected by your browser is often stored in your hard disk, and over time, this unnecessary data can inhibit your ability to install new programs or save documents. If, when trying to save something, you tend to get warnings saying that you are low on memory or space, try deleting your history and cookies. While you may not think it would make a large impact, the accumulation of these files can be a real hard disk hog!